Can Better Bathroom Design Combat Infections? Evolutionary biologist and graphic-design geek Colin Purrington (author of the fantastic taxonomy of lab-notebook inks) has an issue with bathrooms. Specifically, with bathrooms so badly designed that no one washes and dries their hands adequately, and then everyone is forced to touch a door handle in order to exit. He’s sufficiently exasperated that he not only blogged his annoyance, he came up with some public-health messaging to share the spleen: a set of signs formatted for printing onto large-scale Post-It sheets, suitable for guerrilla adornment of any door or a hot-air blower. My pet peeve: bathroom doors hinged in a way that require people to touch the handle or knob to exit. I’m sure there are fire code reasons why architects specify for this, but it’s strange (remote risk of fire vs real risk of disease)…. Compounding the above problem is the fad of equipping bathrooms with only electric hand dryers (“Saves the environment!”). 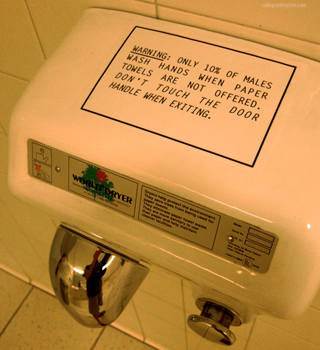 Because cheap hand dryers take about 3 minutes to dry hands, many people opt to just exit the bathroom without washing their hands. Or at least guys.… I don’t hang out in women’s restrooms that often. 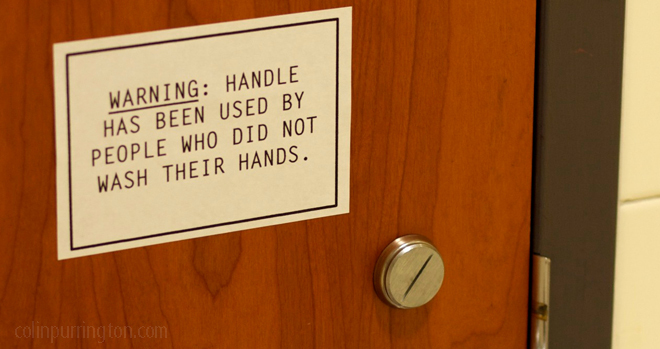 This means that the handle or knob is going to get a lot more use from hands that are coated in microbial nasties. Is Purrington right in his denunciation of door handles, hot-air blowers and bathroom design as an engine of infection? I took a look: There’s a lot of research on germiest hazards in public places, and a little on better design. The answers seem to be: Maybe, Yes, and Yes. Probably the most prolific researcher on dangerous surfaces is Charles Gerba, PhD, of the University of Arizona, who has made a professional practice of swabbing and culturing surfaces in all kinds of public places: bathrooms, offices, day care centers, and highway rest stops. He has found repeatedly over years that door handles within bathrooms are not the germiest spots, relative to the rest of the bathroom: That honor goes to the hot water faucet, because you touch it before you’ve washed bacteria off your hands. And exterior door handles are more germ-laden than interior ones, because at least some portion of bathroom users wash their hands before exiting — though the portion may be no more than 40 to 60 percent. All that being true: Could bathroom design help? Certainly anyone who uses a public bathroom has seen plenty of hands-free sinks and soap dispensers. The ones I use most, which tend to be in airports, seem to have a 50 percent non-operational rate, sending people out either with wet hands or performing that telltale wipe-on-the-thigh-of-your-jeans maneuver. (So if they were intended for infection control rather than efficiency, they’re not working.) And even when they work, hands-free faucets don’t guarantee fewer infections. In 2009, infection-control experts at Toronto’s University Health described in a medical journal that new sinks and faucets in ICU rooms actually increased Pseudomonas infections, because the water pressure coupled with the sink curve caused water to splash from the drain back out on to patients’ bedding. The people grappling with this the most may be schools’ facilities managers, who have the double responsibility of getting students to wash their hands while making bathrooms solid enough to be vandal-proof. (The expert on bathroom vandalization and its broken-window after-effects is Tom Keating, PhD, of Project CLEAN, who’s in Superbug.) Publications such as American School and Universityand Facility Management talk about improving light, using durable materials and avoiding corners and sharp angles where germs can breed. All of this is at best defensive, ways to make sure that people can get in and out of bathrooms without any greater risk of infection. I found just one example of bathroom design intended to keep people in the bathroom longer, out of pleasure — or, depending on how you’re wired, fascinated dread. A couple of years ago, sound artist Jim Green tweaked the sensors in the hands-free sinks of the Denver Art Museum. When you approached the faucets, they didn’t only deliver water: They sang. So, constant readers: Any leads on better infection-avoiding bathroom design? And if not, how would you redesign a bathroom to do this better?